So because this blog is so sadly neglected, here I am posting yet another birth story so that I don’t forget it……without the announcement here that I was pregnant first. Guess it goes to show how much I remember to blog any more. I chose to pursue another homebirth for this precious little one. I ended up using a different midwife than the last two births. One huge bonus this time around is that my midwife (Damaris) came to our house for all our visits! That was absolutely wonderful. I was due January 3, 2017. Because I went overdue with Esther and Luke, we decided not to tell people our due date this time. I was hoping that it would cut down on some of “those” phone calls. You know, where people call you every day from your due date on, asking if the baby is here yet. I got really annoyed with that the last couple pregnancies that I figured this wouldn’t hurt. It was kind of nice to keep the date a secret, and to see people try to guess. I had a miscarriage scare at 8 weeks, but was able to get an ultrasound at 9 weeks where we saw a beating heart. What a relief! Then at our ultrasound at 19 weeks, we found out that this baby was a girl. I had been praying for a girl for a year before I got pregnant, so I was really excited to find out that God had answered that prayer. The rest of the pregnancy was normal for me. No complications, not a huge weighht gain (thankfully! ), but low energy, fibromyalgia flares, and a lot of Braxton Hicks contractions. The Braxton Hicks were less severe this time around though, so I was thankful for that. I had my 39 week appointment on Tuesday, December 27th, and Damaris stripped membranes at that appointment. Based on how the rest of that day went, I had a feeling labor would be soon, but didn’t want to get my hopes up. Wednesday morning started with a single contraction at 7 am. It was severe enough that I told Stephen if I had another like it, I was officially going to call it labor. I had several more off and on through the morning but they stayed far apart and weren’t regular. 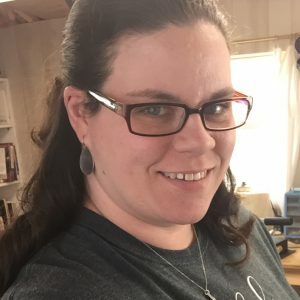 I had been praying the entire pregnancy that God would allow me to have a short labor, and that I’d deliver early (my last two babies were both born after 40 weeks), and that the baby would be smaller than the 9+ pounders I’d had previously. I had prodomal labor with my previous pregnancy too, so I’d also been praying that once labor started, that God would let it just continue and not stop and start. Once I started having contractions Wednesday morning, I was a bit concerned. Stephen needed to take Anna to an appointment an hour away. I was concerned I’d go into active labor while they were gone since they’d be gone for several hours. So I prayed that I’d either go into labor Tuesday night (which didn’t happen), or that it would wait until they got home Wednesday afternoon. The contractions did get somewhat closer together throughout the day but not enough for me to worry. Even though they were getting closer together, they were extremely inconsistent. Stephen and Anna got back home and I felt like I could relax if labor really did pick up. By 5pm, the contractions were getting pretty intense but were still 10 minutes apart. I called my midwife anyway to get her opinion. She told me to call her back at 7:30 with an update, unless things really progressed sooner. I was very torn. If you looked at the app I was using to time contractions, you could see that they weren’t consistent. However, if you looked at the summary of average time between contractions, you could see they were getting closer together as the day went on. I wasn’t sure which to go by, so I went by the fact that some were still 10 minutes apart. As I got off the phone, Stephen walked into the room and told me he’d called our pastor to say he and I wouldn’t be there. Even though Damaris thought he’d be fine to go to church, I wanted him home. He was supposed to preach that evening, and I didn’t feel right asking him to stay home with me even though I wanted him to. After Luke’s stop and start labor, I was convinced this labor would stop if we started putting a plan in place, but I felt a lot better knowing Stephen was staying home. A family from church came and picked up the kids. That was a relief for me too. After everyone left, Stephen and I went for a walk around the cul de sac to see if the contractions would stop. We made it one lap. It was a little chilly out, and I couldn’t stop shivering. In retrospect that was probably the start of transition, but I didn’t recognize it at the time. We got back in the house and I called Damaris. She lives an hour away, so told me she would leave right then to come. The contractions were averaging 5 minutes apart, but they still weren’t very consistent. I was convinced the midwife would arrive and things might stop again. I had no idea how wrong I’d be. I got off the phone with her and ran to the bathroom. One contraction I had while I was in there made me realize that I felt a little “pushy”. I thought “that’s not good” and then figured maybe it was just me imagining things. I stood up by the sink while another few contractions came and went. I looked at the app again and noticed that they were lasting a good 2 minutes each and were right on top of each other. That’s when I realized I really was in transition. I stood there and the thought crossed my mind, “Damaris is not going to make it”. She called a moment later to say she was held up by a train! It was a short one but still had me worried. I started praying that God would just get her here and fast. One of the next contractions was an absolute monster. It was strong enough to break my water. It really startled me – it was a huge, violent pop that you could actually hear. I must have had a lot of fluid because it went everywhere. I was just thankful I’d been standing in the bathroom where cleanup was easier. Not that I could move between contractions, but at least it was not on carpet. Stephen brought a towel to clean it up and I just stood there looking at it, afraid to move for fear I’d slip and fall. I called Damaris back to tell her. She cautioned me to be careful because things can go more quickly once water breaks. I said ok and hung up. I was concerned about the next few contractions, because at that point she still had a good 30 minutes left of driving to get here. The next contraction brought the urge to push. I almost threw my phone at Stephen telling him to call Damaris immediately to let her know. He put it on speaker so we could both hear her. Stephen had been filling the birth pool, but it was only halfway full at that point. For some reason, the water was murky colored, even though he’d changed the well filter a few days earlier. Damaris asked me not to get in. I panicked a little mentally – my last two births had been water births and that’s all I wanted this time too. She had been telling me to breathe through the contractions instead of pushing, so that’s what I had tried to do. Stephen was right there supporting me, saying don’t push…..and all I could say was I can’t NOT push. My body was wanting to push on it’s own at that point. Damaris told me not to fight against it and that she could walk us through it on the phone. Once I get the urge to push again, I did, and knew that the baby was very close. She asked if Stephen could see the head, and he said no. I reached down and could feel the baby’s head crowning. I knew that the next push would be it. He had not been in a good position to deliver the baby since I’d been standing by the bed, and he had been at my side supporting me. I felt myself starting to push and yelled at him “catch!” because I knew I wouldn’t be able to catch her myself. A couple of big pushes and she was born. Damaris said she wasn’t sure if I had delivered or not since I hadn’t made a lot of noise. In my memory I roared, but Stephen tells me I didn’t make much noise at all. He passed the baby up to me and I just stood there in awe. She looked so tiny! We had changed the sheets on the bed but didn’t have anything else laid out, so it took him a few moments to dry himself off and find something to wrap around the baby. We had had it all bagged and set aside, but not laid out since we didn’t expect active labor to go so fast. Stephen helped me up onto the bed so I could rest. Our midwife arrived 15 minutes later. She was just in time to help me with the placenta. Stephen was completely calm throughout everything, even though it was never in his plan to deliver the baby by himself either. But it was so nice to have our midwife arrive and take over. A few minutes later, her assistant arrived too. They both just barely missed it, and yet Stephen had almost everything cleaned up by the time they got here. They both joked that he should be called an honorary midwife. 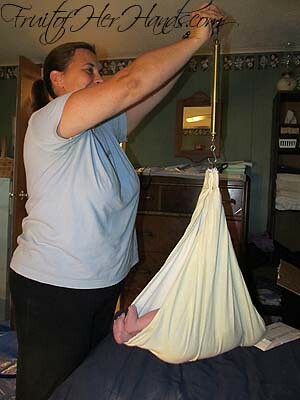 I never dreamed I’d have an unassisted homebirth. That was never part of my plan, but it was an amazing experience anyway. In retrospect, there were many moments where I wondered if I should call Damaris to have her come, but I always dismissed the thought, thinking surely my labor would be longer. I’m a bit humbled, actually – God answered every one of my prayers about my labor, yet I never expected Him to actually allow me to have the shorter labor I had asked Him for. I should have just made the call sooner when I’d thought of it; if I had, Damaris would have been here for the birth after all. Next time I pray for something, you better believe I’ll be praying with more faith! Baby Joy weighed in at 8 lbs 15 oz, and was 19 ½” long, and was born at 8:15pm. 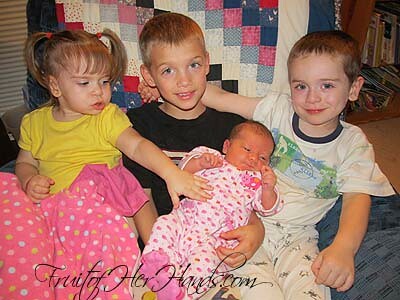 By the time we got a phone call from our friends asking where to bring the kids, we were able to tell them that the baby had already arrived and that they could just bring the rest of the kids home instead of meeting Stephen’s parents like we’d originally planned. I never dreamed that I’d go into active labor AND deliver the baby by the time my kids got back home. 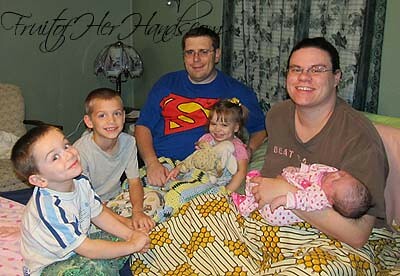 It was so nice to have everyone under one roof for our first night as a family of eight. 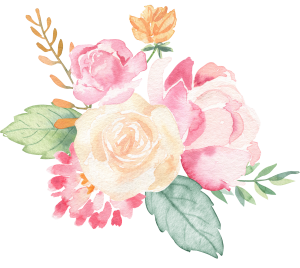 My first time blogging in a year, and I come to type out my birth story….I never even mentioned here that God had sent us another little blessing…. This time around we had some confusion with my due date. 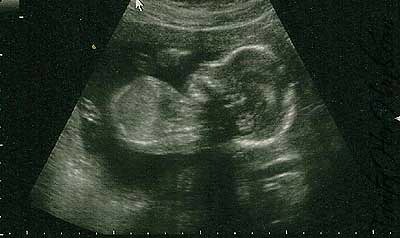 We weren’t quite sure when it should be, so my midwife sent me for an ultrasound for dating. The date we came up with was about a week sooner than by my closest calculation, so we went with that. It was July 15th. As usual, the Braxton Hicks contractions started for me mid-pregnancy. The first part of the pregnancy was pretty good, I pretty much just felt great. 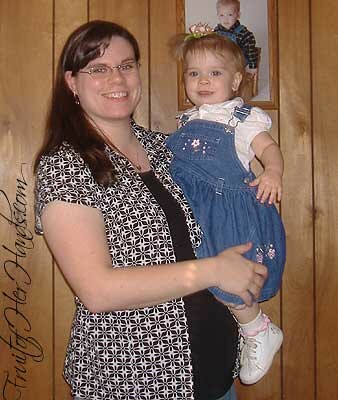 The third trimester brought with it a massive fibromyalgia flare, that seemed to last the entire rest of the pregnancy. July 15th came and went. I was very frustrated and miserable. I had many episodes of strong contractions that week, but no other signs of labor being any time soon. At my appointment on the 15th, my midwife Christine decided not to schedule an appointment for the next week. We figured if I needed one, we could schedule it at the last minute. That Saturday (the 20th – which was the date I’d been going by from my own calculations), I noticed shortly after getting up that I’d been having regular contractions for a while. They weren’t unbearable, but were pretty regular. We had a youth meeting at church that afternoon, but I figured I’d just go, and come home if things picked up too much. By the time I sat through the first part of the service, I was absolutely miserable. The contractions weren’t completely regular, but were strong enough that I had to breathe through them. I texted my midwife, who told me she thought I should head home and take a nap….that way I could get some rest and see if they’d stop. We left the van at church for a friend to drive the kids home (we had taken two cars) and headed home. I laid down…and the contractions almost stopped. I was so frustrated because this had happened several times over the past couple weeks. That evening, after the kids got back home, the contractions started again. This time they were more intense, and were nice and regular. I called Christine and she and her assistant headed over. Once they got here, the contractions had spaced out again. She checked me, and I was only dilated to about a 4. I could have cried. After all the contractions I’d had, I was really hoping to be farther than that. We walked up and down the street trying to get things going, but it didn’t work. Christine checked me again, and found that there hadn’t been any change at all. She told me to go to bed and rest, and that maybe things would start back up again by morning. She and her assistant left around 1 am. I was so discouraged. I did sleep, somewhat. I fell right to sleep, but even stronger contractions were waking me up….but they were so far apart that they seemed worthless. Morning came and we headed off to church. I was so upset to even be going because I had so hoped to be holding the baby by then. But the services were wonderful and just what I needed. Looking back, I’m glad I went, even though I’d wanted to have had the baby by then. When I went to bed that night, again the very strong contractions were waking me every so often, but they were so far apart still that I just dismissed them. They started getting closer together as the night went on, and by 3 am I woke Stephen up to have him start timing the contractions. They still weren’t terribly close, but were so intense that I figured it was finally the real thing. By 4 am I couldn’t stay in bed any longer, and I called Christine not long after that. The boys woke up right around 6, and Christine and her assistant Nicole both got here shortly after that. By the time they got here, I noticed that the contractions were spacing out again, so we went for a walk. I could have cried. I was so afraid things would stop again, even though the contractions were so intense I was convinced this really was labor. Stephen called his mom to tell her I was in labor, and she decided to come over to get the kids. That hadn’t been our original plan, but it worked out very well. A little while after Mom left with the kids, Christine decided to check my progress. She got this funny look on her face, and said, “You’re not going to believe this, but you’re dilated to an 8.” She was right – I couldn’t believe it. After the contractions had been so far apart, I was shocked to have made that much progress already. After that we just waited. Christine told me later that she’s seen other labors where the mom is distracted for whatever reason, and labor stalls. All along, I thought I wanted the kids here while I was in labor, but apparently that wasn’t the best option after all. I wanted to get in the birth pool, but the contractions were still only about 5 minutes apart, so Christine suggested I wait a bit longer. We filled the pool, and we waited. Finally the contractions got closer together and more intense. After having had Esther in the pool, all I wanted was to be in the pool this time, for the pain relief. I was willing to wait though, to avoid having things slow down once I got in the pool. Then I noticed I was feeling a bit “pushy” during some of the contractions…..and they were close enough together that I was allowed to get in the pool. What relief! The nice thing about the pool is in between contractions seems to be almost completely pain free. For me, it is, anyway. It was some time after 10 when I got in the pool. The week before, Stephen had listed some goats on Craigslist that we were trying to sell. One lady wanted to come get them, but wasn’t able to come until Monday morning between 10 and 11. Now, here it was, Monday morning, after 10, and I was about to deliver. She had never given Stephen her phone number, and had an hour and a half drive here. I was kind of hoping that she’d get lost on the way, so that I could deliver before she arrived. That didn’t exactly happen. After a couple contractions in the pool, Christine told me I could try pushing to see how it felt. With my other labors, I hated pushing. This time, it felt really good to push – like I finally had something productive to do. I tried pushing a couple contractions, and then Christine told me she needed to check me again. So far, my water had not broken. I was so close to delivering that we decided she would break my water to help me deliver. She told me later that the water was so hard to break that she wasn’t sure how much longer I would have been in labor if she hadn’t broken it. Right about then, we heard a car pull in the drive. I figured it’d be a while yet so told Stephen to quick go outside and sell the goats and get back in the house. Two contractions later and I realized how wrong I’d been. I told Christine I thought it would be awful if I delivered the baby while Stephen was a few feet outside. Nicole went running for the door, yelling for Stephen to get inside immediately. He got in the house and Luke was born almost immediately. After his head was out, I heard them talking about checking the cord since Luke had the cord wrapped around his neck. One more push and Christine was handing me my baby. I just sat there, looking at him, enjoying having this precious little one in my arms. I told Stephen I didn’t mind if he went back outside to finish up with the goats (we could still hear the lady in the drive at her car). At that point I just wanted her gone so we could enjoy our newest little one. Stephen was only outside for a few moments, and when he came back in he was able to cut the cord. I delivered the placenta really quickly too, and they helped me into the bed. What relief. I couldn’t wait to take a nap! After Luke nursed for a while, they did the newborn assessment. I had been saying all along that I thought he would be at least 9 pounds 4 ounces…..and he weighed in at 9 pounds 5 ounces. He was 21 inches long, and was born at 11:00 am. It was a really strange labor, and the most rested I have ever felt while in labor. It was so peaceful and laid back. From start to finish it was 8 hours long, but that didn’t really seem that long once it was over. I felt so good afterward. I just felt like I’d been exercising for 8 hours straight, but it was a “I’ve been working” tired, not a “I’m in so much pain” tired. Stephen is amazing too. 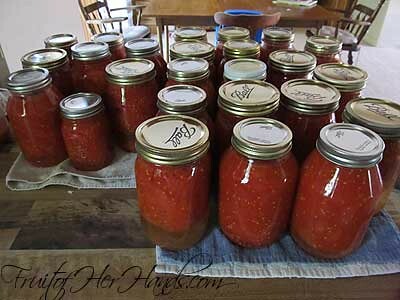 When I was napping after having the baby, he was in the kitchen canning tomatoes. What a guy. I know he was tired too. I still can’t decide who Luke looks like. He just looks like Luke. He has the same olive coloring that Anna has, and looks a good bit like the baby pictures I have of her. But he looks different enough too that I’m curious to see what he looks like as he gets older. 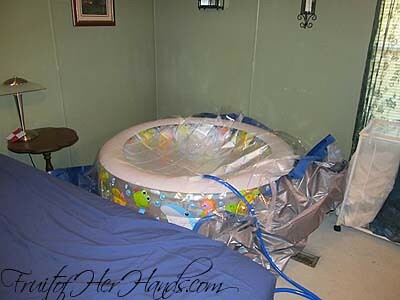 It was a fantastic home water birth experience. I have a wonderful midwife (and her assistant too!). The whole thing was absolutely wonderful. Now Luke is a week and a half old. He doesn’t sleep much at night unless it’s on me, but I know that phase will pass soon enough. He nurses like a champ and is gaining weight very well. At his first visit to the doctor on Tuesday, he weighed 9 lb 6 oz – he passed his birth weight at one week. The big kids all love on Luke constantly. Esther took a little while to warm up to him, but now she’s constantly at my side, talking to Luke and patting his head and tummy. What an amazing experience. If I had to do anything over again, I don’t know that I would change a thing. We decided pretty late in my pregnancy to deliver at home. For years, we’ve assumed that we live too far from a hospital and that that would rule out any chance of a home birth. 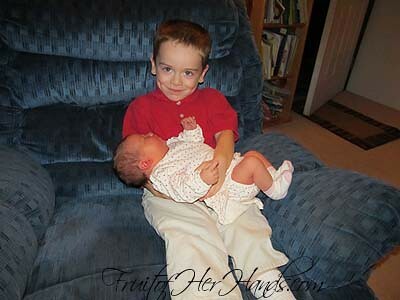 A month after Anna was born, a birth center opened in our area. 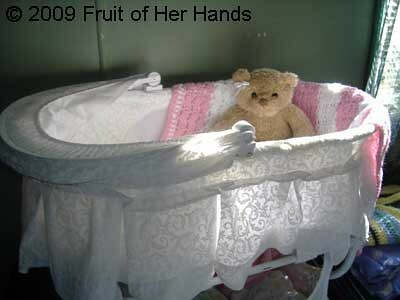 We decided to have this baby at the center and I began seeing one of the midwives there. From the beginning I was very impressed at the difference in the level of care there. Everything was so relaxed and done the way I’ve always preferred about pregnancy, and I loved that my midwife Christine actually cared about me as a person instead of being just another client to see that day. At my 30 week appointment, I mentioned to my midwife that I wished we could just deliver at home. To my surprise, she informed me that it was possible,and that our distance to the hospital actually wasn’t an issue at all. Wow. I drove home from that appointment completely giddy. I have always wanted to give birth at home, and now here it was an actual possibility. When Stephen and I discussed it, he too surprised me by saying we could pursue it. So the adventure began. From being at the birth center, I knew I wanted to try water birth this time around. Instead of renting a birth pool, we ordered a small kiddie pool to use as a birth pool instead. At around 34 weeks, I started having some episodes of regular contractions, so Christine put me on restricted activity. It wasn’t bedrest, but we wanted to make sure baby stayed put a few more weeks. 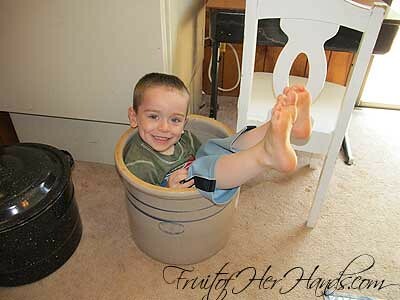 I started to worry we wouldn’t get the home birth I’d dreamed of – SC law doesn’t allow home births before 37 weeks. After weeks of thinking, “Maybe this is it,” my due date came and went. What a shock. Caleb and Anna had both been born at 39 weeks exactly, and I had really gotten my hopes up that Esther would come a bit early too. I was wrong. My due date was on a Monday. That Wednesday, Anna started running a high fever so we took her to the ER (it ended up being a mystery something that resembled a UTI – results were inconclusive). I’m so thankful I didn’t have to juggle 3 kids and a newborn in that waiting room! The next day I saw the midwife again. She stripped my membranes, and since I’d been having other signs labor was close, we didn’t schedule another appointment. Friday morning around 3:30 I woke up to contractions. We timed a couple and found they were 13 minutes apart, so we tried to go back to sleep. They got a little closer together, but were pretty manageable. We made a few calls around 8 to put people on alert, but didn’t have anyone come yet. By midmorning, the contractions had really slowed down. They had been as close as 4 minutes apart earlier, but went to closer to 20 minutes apart. I wanted to cry I was so discouraged. At that point I prayed that labor would pick up soon, and it did. The contractions got closer to 10 minutes apart. Some were only 6 or 7 minutes, but they still weren’t consistent. My friend Karen called me around lunchtime to see how things were going. I told her that she could pray that things picked up. She prayed right then that labor would pick up and that the baby would be born soon. Almost immediately the contractions went to three minutes apart. What an immediate answer to prayer! They were still tolerable but I wanted my midwife here, and she had a nearly hour-long drive to get here. Stephen started to set up the birth pool. All I could keep thinking was that I couldn’t wait to get in that pool, but it wasn’t ready yet and I wasn’t going to get in it until Christine got here. I knew it could slow down labor if you get in too soon, and after the way things had gone so far I didn’t want to chance it. Our friends arrived to get the kids. At first I’d thought I wanted them here, but the contractions were so intense that it was easier to handle the pain knowing they were off having fun with someone else. Christine finally got here and we settled in to wait. Finally the pool was full enough and I had permission to get in. I had heard the water referred to as a midwife’s epidural, and wow – is that ever true. It made such a difference in pain management. It seemed to take away all the pain between contractions. They were still extremely intense and hard to breathe through, but at least it felt like I was getting a complete break in between. Right after I got in the pool, the midwife’s assistant arrived. She had left a little later and had to deal with the beginning of Friday afternoon rush hour traffic to get here. I hadn’t had a chance to meet her beforehand, but ended up really liking her. The urge to push came a lot sooner than I expected. Christine checked me, and told me to wait another few contractions and just wait until the urge to push was so strong I couldn’t ignore it any more. She let me try a few pushes, but they still hurt so we continued to wait. Once I felt like I HAD to push my midwife gave me a few suggestions of positions to try and I started pushing. It was harder to actually deliver the baby than I expected, but thankfully I didn’t have to push long. At one point I could hear the midwife saying, “With the next contraction your baby will be born.” That was such an encouragement to hear! The next thing I knew, I heard her tell me to reach down and pick up the baby. I looked down, and here came Esther floating to the surface. It was an absolutely surreal moment to see her there in the water. After that I sat back against the pool and just held her. We checked and sure enough, she really was a girl. They handed me a blanket to put around her, and she started to nurse. She was a hungry little thing – we sat there and she nursed for almost an hour. After she finished, I looked down and she had popped her thumb in her mouth. We had wondered if we’d have another thumb sucker. . .
Then they helped me get out of the pool and into bed. That was the most wonderful feeling – climbing into my own bed after having the baby. Stephen left the room and started to make all the “she’s here” phone calls, and we started to do all the after birth exam stuff. It was so fun to watch Christine do the newborn exam. We knew at the end of my pregnancy that Esther would be a good-sized baby, and she definitely was. She weighed 9 pounds and 2 ounces and was 19 1/2 inches long. The interesting thing was that even though Esther was my biggest baby by far, hers was the easiest birth I’ve had yet. It was so much more relaxing to be at home in my own bedroom delivering, instead of in a cold hospital room with bright lights aimed right at the bed. Instead of being told what to do and when, my midwife let me listen to what my body was doing and we worked with it, not against it. When I had to push, it was great to be able to try pushing instead of being told to wait or when I could push. Not only that – I really liked being able to deliver in a position other than flat on my back. After all the exams and cleanup were done, our friends brought the kids home. 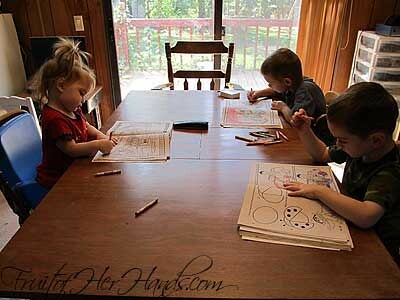 It was so fun watching the kids see their sister for the first time. It was an absolutely amazing experience. I’m glad it worked out for me to be able to have a home birth – it really was everything I’d dreamed of. The boys are absolutely smitten with Esther, and Anna is quite the little mama, patting and shushing and loving on the baby. 39 weeks and 1 day pregnant. Officially the longest I’ve ever been pregnant. Measuring 41 weeks. Officially the biggest I’ve ever measured while being pregnant. I sure hope this little one arrives before too long, or she’ll never be able to wear all those adorable tiny little dresses. . . I am absolutely in awe that God has sent another little one into our family. It amazes me that I’m over halfway through this pregnancy already too. I am so blessed. …yes, I really am pregnant. I’m just shy of 13 weeks and am due in October. We’ve known for quite a while but just didn’t say a lot until recently. Those who see me in person know, because I started showing pretty early, but we haven’t really made much of an official announcement. We are thrilled that God has sent this new little one to us. I’m absolutely amazed that after our years of infertility, God continues to send us more blessings. What an honor. I am beyond excited. We thought it would be fun to announce on April Fool’s Day – to see how many people believed us and how many didn’t. Honestly, it’s a bit of a letdown; it wasn’t quite as fun as I thought it would be. But that’s ok. So there you go. It’s true. We’re expecting #4 this fall. God is so good. She’s here – Miss Anna made her appearance on Monday. Monday started out with an OB visit, as they had been for weeks. I’d been feeling pretty miserable, but prayed on the way there that I just wouldn’t be disappointed with whatever I found out. When they checked me last week, I left the office really disappointed because I was only dilated 1 cm. I was hoping for better news this week. The midwife measured me and made a face. Little Miss was measuring large enough that I could tell she was concerned. Then she did an internal check, and the first thing she asked me was if I’d been having contractions. She told me I was dilated 4 cm, and left the room to talk to one of the doctors in the practice. It turns out that things were so favorable for a quick delivery that she was concerned that I wouldn’t make it back to the hospital in time if I waited to go into labor. She allowed me to go home and gather my things but told me pretty much to go straight to the hospital. I really wasn’t thrilled at the thought of an induction, but given the circumstances (especially the distance we live from the hospital), I trusted her judgment. I called Stephen and told him, “We’re having this baby today. I’m bringing the van home and we’re supposed to head right back to the hospital!” By the time I got home, one of the ladies from church was there and we were able to leave. We arrived at the hospital and checked in. I kept telling Stephen how weird it was checking in without being in labor. They hooked me up to the monitors, and while we waited for the midwife to arrive, I kept wondering if the contractions I’d been having were even registering. The midwife arrived soon after that and broke my water. It was interesting to listen to the details as she told the nurse what to chart after my exam. It turns out that I had already been in labor (not what I expected to hear!) – was dilated almost 6 cm, 80% effaced, and had been having contractions every 3 to 4 minutes. What a shock. The contractions intensified almost immediately, but still were bearable. They felt just like the ones I’d been having for weeks, so it wasn’t hard to endure them. Two hours later, they started me on Pitocin. I’d been hoping for a drug-free birth, but figured I’d just wait and see how things went with it. The nurse told me I’d feel the difference in contractions in about an hour, but they got stronger and closer a lot faster than that. Finally, the pain got to the point where I asked for some meds. I didn’t want an epidural so they gave me Nubain instead. Two or three contractions later, I felt like I needed to push, so they brought the midwife back to check me. I had just told the nurse earlier how I thought it would be hilarious if the first time they checked me I was ready to push. Imagine my surprise when that’s exactly what happened! Things went so quickly from there – it seemed like only 2 or 3 contractions later they were moving things around, repositioning the bed, and telling me to push. 4 pushes later, and Miss Anna was here. Wouldn’t you know it, the pain medicine kicked in right after the midwife finished all the after birth stuff. LOL! I told Stephen if I would have known I was that close I never would’ve bothered with the drugs. Oh well. After a 29-hour labor with Caleb, it was a real shock to only knowingly be in labor this time for 4 hours. Anna was 8 lb 5 oz, and 20 inches long. 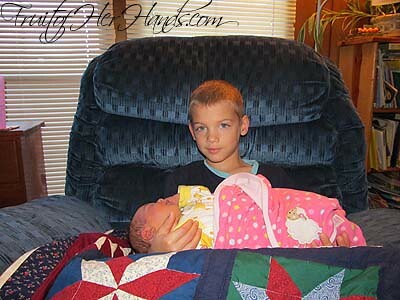 That’s so close in size to Caleb when he was born, but she seems so much smaller. We are totally in love. She’s just so precious! She is a champion nurser (another thing I prayed about a lot! ), and is pretty content for the most part. I’m still in awe that God sent us a little girl! When I got home from my weekly OB appointment today, I could hear this awful clunking coming from the laundry room. 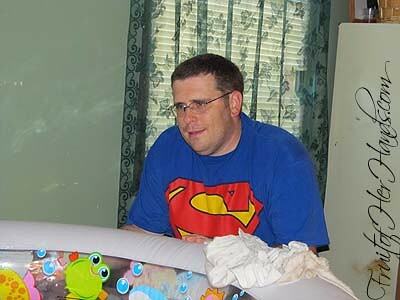 It turns out that Stephen had washed the bassinet parts and they were in the dryer. Just about everything is ready for Little Miss now. There’s just under 3 weeks until my due date though – so who knows when she’ll actually make her appearance. On Saturday, my church threw me a baby shower. I am so thankful that they throw showers for every baby! What a blessing! We didn’t need a lot of things since this is baby #3 for us, but since she is girl #1, we did need some clothes. 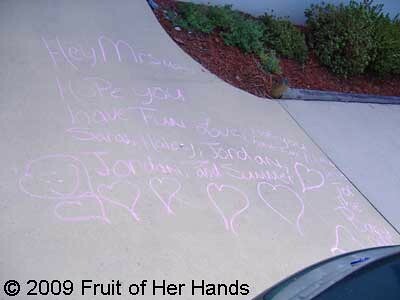 When I got to church, I discovered this message on the sidewalk right outside the door. It basically says, “We hope you have a great baby shower,” and all the little girls that were there before I got there signed it. When I got home, I wasn’t feeling very well so I immediately threw everything in the wash, just in case I really would go into labor that night. I didn’t, but at least everything is washed, sorted, and put away now! I dug some of it back out this morning to take a picture of it. It’s not everything, but it’s a good idea of what our church family gave. I’m so thankful – nobody HAD to give anything, yet what they gave was such a blessing to me!